Toddlers and their caregivers are invited to join us Wednesday mornings, beginning February 6, 2019, for engaging Story Times! 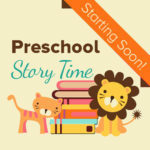 Each Story Time session will begin at 10:30 am. Stories, songs, crafts, games, and literacy-related activities are thoughtfully selected to help you and your child develop a mutual love of reading and socializing with others. Advanced registration is not required; however, each caregiver will be asked to complete a brief participation form on the first date of the child’s attendance. Please consider joining us!